The McIntire Department of Art sponsors an interdisciplinary Program in Mediterranean Art and Archaeology, leading to the Ph.D degree. Founded in the 1980s, the program aims to foster a thorough acquaintance with Greek and Roman visual and material cultures, it also allows students to acquire a broad understanding of ancient culture. Reading knowledge of Greek and Latin is encouraged, and competency in relevant modern languages is required. Students typically work closely with faculty in other departments such as Anthropology, Classics, History, or Religious Studies. All incoming students in archaeology are required to participate in the Classics pro-seminar during the Fall of their first year. Course work may also be taken in a relevant post-classical period, such as Medieval or Renaissance. At an appropriate stage in their graduate study, most students in the program will also participate in archaeological field work. Recent students have worked at Pompeii, Morgantina, the Athenian Agora, Isthmia, Mycenae, Tel Dor (Israel), Porolissum (Romania), Atheniou (Cyprus), Heraclea Sintica (Bulgaria), and Hacimusalar Hoyuk (Lycia, Turkey). The curriculum is determined by the student's preparation, interests, and needs. Course work for the Ph.D. should be concentrated in the area of specialization in ancient art (sculpture, painting, architecture, or various period fields) and in the special field, as described above. The Ph.D. examination in the area of specialization takes place after the completion of course requirements. The program instructors include Anastasia Dakouri-Hild, John Dobbins, Tyler Jo Smith, and Fotini Kondyli. Students are encouraged to work closely with faculty in other departments such as Anthropology, Classics and History. 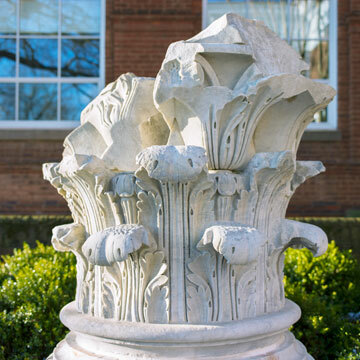 The Archaeological Institute of America Charlottesville Society is based at the University; most graduate students become involved as members and participate in local events.